Chronic Wasting Disease (CWD) has been found in elk, deer, and moose in several areas of Wyoming and has been moving ever closer to the already brucellosis infected elk herds that use feeding grounds in northwest Wyoming. The feeding grounds long ago caused the elk to stop migrating to a unique area along the Continental Divide called the Red Desert far to the south. 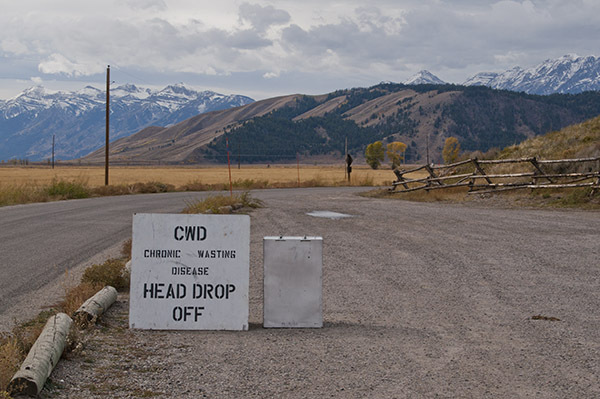 CWD testing, elk and deer head depository. Grand Teton National Park. Copyright Ralph Maughan 2011. So, what do they do when an infected brain shows up in the box? That is too late. A retired biologist who worked at the National Elk Refuge near Jackson is calling for an end to the feeding program and putting forth an idea to train the elk their former migration route south. He is hoping to avoid the oncoming CWD outbreak which will undoubtably infect entire herds and soon enter Yellowstone National Park causing a wildlife disaster. The feeding grounds are like petri dishes for disease because of the high density of elk. Brucellosis thrives on the feeding grounds and continues to have wide ranging repercussions for elk and bison in places far removed from the feeding grounds. Also, CWD has a nasty habit of infecting soils for the long term leaving an area capable of infecting elk for years and years. CWD is a prion, or a virus made of protein rather than RNA or DNA like most viruses. It is related to mad cow disease, scrapie in sheep, and Creutzfeldt-Jakob disease in humans and is deadly. CWD results in a condition called spongiform encephalopathy, meaning that the brain of its victims has spongelike holes in it. It is unknown whether CWD infects humans but it is recommended that people avoid coming into contact with the nerve tissue of the animals such as the brain or spinal column. So very important to get this word out! This disease is a nasty one, yet it seems to reside on the back burner where I live. We need to be proactive and protect the wildlife and ourselves! -M.
I wonder how the locals will try to blame those big bad Canadian Wolves for this? On the contrary, anti-wolf ‘ locals” should welcome wolves into areas where CWD is prevalent. The wolves will mitigate the spread of the disease as they naturally key in on the slower weaker elk afflicted by CWD and by rote leave behind a stronger elk herd by culling. I actually think this has already happened in NW Wyoming when Mule Deer with CWD were reported in the Owl Creek drainage of the southern Big Horn Basin for a couple years before the first wolves dispersed there, the Washakie pack. After the wolves had been there a while, new instances of CWD were nil. This is all anecdotal, of course, but when we say wolves are a positive force of ecology , disease mitigation is one aspect of that. The state game agencies seem reluctant to acknowledge that. I think the wolves are about the only entity out there that is doing something to retard the disease. There is evidence that wolves as they tend to kill the weaker animals can detect this defect and take down the diseased elk or deer before it has contaminated as much of the area as one that develops the full blown disease, withers and dies, leaving a pile of nasty prions. Another reason for the GL states to think twice prior to some proposed ideas of wolf management. EFSA and the European Centre for Disease Prevention and Control (ECDC) recently delivered a scientific opinion on any possible epidemiological or molecular association between TSEs in animals and humans (EFSA Panel on Biological Hazards (BIOHAZ) and ECDC, 2011). This opinion confirmed Classical BSE prions as the only TSE agents demonstrated to be zoonotic so far but the possibility that a small proportion of human cases so far classified as “sporadic” CJD are of zoonotic origin could not be excluded. Moreover, transmission experiments to non-human primates suggest that some TSE agents in addition to Classical BSE prions in cattle (namely L-type Atypical BSE, Classical BSE in sheep, transmissible mink encephalopathy (TME) and chronic wasting disease (CWD) agents) might have zoonotic potential. I glanced through this. I think you are saying that wolves will eventually develop a TSE from eating CWD-infected deer or elk. Is that right? I think you suggest that wolves will then spread it? If I understand you, this is a two step argument and neither step has been shown to be so, though they are plausible. The best thing Wyoming could do is to shut down all their elk feeding lots because they are a great magnification of risk in transmitting and polluting the ground with CWD prions. I mentioned wolves in part because they might be forestalling the transmission of the disease to Yellowstone to some degree, making them many times more useful than Wyoming Game and Fish Department in this matter even if they help just a little bit and in the short run. A lot of coyotes have been dining on CWD deer in the upper midwest (Wisconsin, etc) and so far I have not heard of them getting CWD. The differences in the canine and ungulate prion proteins might be enough to block transmission. Well if humans don’t get CWD I suspect that carnivores are even less likely to acquire it. Because their prey is often already dead or sick they have to be resistant to many things that would fell a human. I think our medicine might benefit if the origin of their resistance was studied a good deal more than it is. I just returned the downtown post office and stopped in the Country Bookstore in Bozeman. There was a new book on the cashier’s desk Call: Where Elk Roam by Bruce L Smith Phd. It is about the Jackson Hole elk heard. Here is the book’s web site, for those who are interested it looks like a good read. This is interesting. The narrative I remember from living in the region in the 1960s and 70s (albeit only as a kid) was that feeding on the refuge was started because the migration corridor and winter habitat in the Green River was lost to ranches and fencing. Perhaps it’s a chicken and egg argument if the ranchers wanted the elk contained so they could take the habitat, and the feeding stopped the elk from migrating. Obviously, if there is still a migration corridor and good, accessible habitat left it would be preferable to use it. I find elk supplemental feeding to be somewhat analogous to salmon hatcheries — you’re spending money doing it to get around an environmental bottleneck, while battling disease problems and creating a predator magnet and other potential problems. In that way, restoring natural migration (if it is possible) would be analogous to the Elwha Dam removal. My memory of Jackson Hole in winter is that the snow gets pretty deep, so wonder if trying to support anywhere near the current number of wintering elk would be feasible without dam removal (er re-establishing migration to more winter range). As far as the threat of disease, if it is not enough to politically to change the hatchery/wild composition of winter range at this time, if it does become a major problem it may actually end up a beneficial catalyst (as one would hope the appearance of European ISA in B.C. will be relative to salmon farm policy). Sorry for over-analogizing. I could not agree with you more about closing the elk feeding lots. my original posting was much longer (i just have a lot to say) and i had to cut it back. I mentioned the wolves study and left out the risk factors for feed plots, food plots, animal protein feeding etc. please let me get this perfectly straight. i am not anti-hunter, i don’t care what you eat, i am a carnivore. i simply made a promise to my mother back in 1997 about getting this information out there. and it seems i have wasted 14 years, i hope not. i lost my mom to an exceedingly rare strain of the sporadic CJD i.e. hvCJD, and i simply never did and still don’t accept the myth that 85%+ of all human TSE prion disease i.e. sporadic, is a happenstance of back luck, a spontaneous event, that just happens. and i fell off a shrimp boat yesterday. and now today, we find that indeed, some BSE causes sporadic CJD, and they are finally warning that the potential for CWD and atypical scrapie could be zoonotic infectious diseases in humans as sporadic CJD. i been saying it for over a decade. the old transmission studies said it long ago. probably not enough room on this board to post what i want to post, and some probably don’t want to hear it. but these are the facts as i have come to know them over 14+ years, following these TSE in different species and studies there from, daily, as a layperson. i hope some of you will find this data useful. i do not advertise on these blogs where i post this science, as i think the science, and truth there from these human and animal TSE prion disease should be free to all. A. ORAL TRANSMISSION to deer and elk is a very efficient mode for transmission. HIGH PROTEIN FEED will transmit CWD. high protein feed have been fed to deer and elk, especially in game farms. B. COMMINGLING OF DISEASED ANIMALS AROUND BAIT PILE. chance of the environment in the surrounding areas becoming infected, from feces, urine, shedding, becoming a hot bed for animals to feed, congregate, and become exposed, and there is still very much the possibility of lateral transmission, especially with the CWD TSE, in deer and elk. WHY ignore sound science ? IT’s the same with pouring a bottle of 100% deer urine scent formulas all over you and the environment, this is a proven mode of transmission. SO WHY DO IT? a corn plot, or any feeding plot, where it brings animals in to feed, will create a spot for these deer and or elk to commingle, thus, you have created a hot spot for CWD, for other animals to come and feed, become exposed, by methods not _natural_. you would ‘enhance’ the spreading by means not natural. i am sure there are natural feed plots this will happen anyway, but why enhance it? may make your hunt a little more challenging, but again, why enhance it? then then these animals leave these feed plots, some may not, but they then go on to expose other areas. believe me, i don’t pretend to have all the answers, but science tells us now that this a very real problem. i suppose my main question i would like answered is, why when so many have been exposed, only some become clinical and die. with CWD, it seems that this is the most efficiently transmitted TSE to date. is it a genetic thing, an environmental thing, metals, what, to make some more susceptible to clinical disease and death, than others? i am not a big fan of the OPs, and or metals theory, to many folks think they are the _cause_. transmission studies have clearly proven this wrong. and until a metal or OP can transmit disease, more than once, and by second passage, it is not a TSE, and does not _cause_ them. Bastian et al believe it’s the spiroplasma thing, others theories a virus thing Manuelidis et al, but we must not ignore what we do know by TSE transmission studies to date. as hunters, it’s your choice, and many difficult decisions lay ahead. i don’t pretend to have all the answers, but i can tell you this, do not flounder with this CWD, TSE agent. Would like to have commented on the mass of information you posted, but it is overwhelming. May I suggest it be broken down and presented in smaller pieces? I am very sorry to hear of your wife’s sorry demise (or murder, as one might argue). It certainly motivated you in the right direction. Even with Jackson’s development, there seems to be far more winter range intact in Wyoming then anywhere in Colorado, Idaho, and Montana. The feedgrounds are much more about protecting ranching interests and hayfields for cattle. What would impact elk migrating from JH to the Green River is the amount of traditional winter range that is grazed and/or cut and baled extensively in the summer months. How much feed is left in those areas if elk were to make there way back to the Green and beyond? Their policy evidently is, we won’t find any mad cow if we don’t look for it. And not looking for it protects our markets. The cow that tested positive in Washington State in 2003 was detected by a fluke: contrary to official pronouncements that the cow was unable to walk and therefore mandatorily tested, the cow was fully ambulatory but too unruly to go in the chute. So, the “knocker” killed her in the trailer. Because she was killed outside, she was tested. How many infected, ambulatory cattle have since gone into the supply chain?